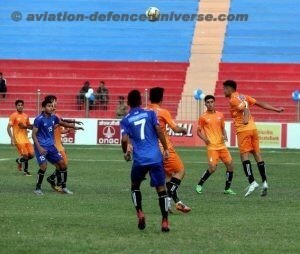 Glimpses of Junior Boys (U-17) final match of Subroto Cup International Football Tournament-2018 played between Bangladesh Krida Shiksha Prothishtan (BKSP) & Amini School, Afghanistan held at Dr. Ambedkar Stadium, New Delhi, today. New Delhi, 20 Nov 2018. Closing Ceremony & Final Match of Junior Boys of the 59th edition of Subroto Cup International Football Tournament was held at Dr. Ambedkar Stadium, Delhi Gate, New Delhi on 20 Nov 18 at 1545 hr. Air Chief Marshal BS Dhanoa PVSM AVSM YSM VM ADC, Chief of the Air Staff & Chairman, Subroto Mukerjee Sports Education Society was the Chief Guest for the ceremony. Ms. Sonia Lather, Silver Medal winner in the AIBA Woman’s World Boxing Championship 2016 was the Guest of Honour during the ceremony. Wg Cdr Yashdeep Dabass and Flt Lt RK Herojit Singh (Medal winners in the various national Para Swimming competitions) were the Special Guests for the ceremony. His Excellency Mr. Khairullah Azad, Political Conselor, Embassy of the Islamic Republic of Afghanistan and His Excellency Mr. Gautam Bhattacharya, Minister Counsellor & Deputy Head of Mission, Embassy of Sweden were also present during the event. 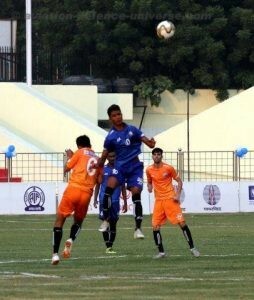 The final match was played between Amini School, Afghanistan and Bangladesh Krida Shiksha Prothishtan (BKSP), Bangladesh in which BKSP won the championship with a solitary goal scored by Habibur Rahman (Jersey No. 15) at the 11th minute. A total of 95 teams, 1500 players 149 officials participated in the tournament making it one of the biggest tournaments in its category in the entire soccer world. There were 08 teams from 03 overseas countries, viz. Afghanistan, Bangladesh and Nepal. 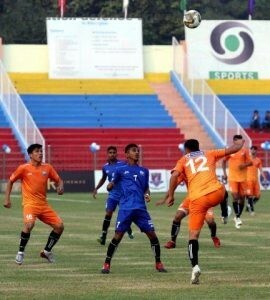 Best Goalkeeper award was presented to Pranub Limboo of Govt. Senior Secondary School, Namchi, Sikkim and the Best Player award was presented to Mohammad Nemil of Reliance Foundation School, Mumbai. Best Coach award was presented to Mr. Raghu Kumar of Army Boys Sports Company, Banglore and the Fair Play Trophy was given away to Reliance Foundation School, Mumbai. The award for Most Contributing School for Football was presented to NNMHSS, Chelembra, Malappuram and Kerala for their contribution towards development of football. 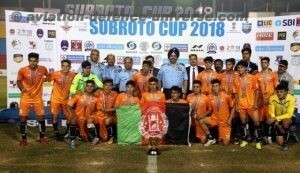 Air Chief Marshal BS Dhanoa PVSM AVSM YSM VM ADC, Chief of the Air Staff with the runner up team Amini School, Afghanistan after final match of Junior Boys (U-17) of Subroto Cup International Football Tournament-2018 held at Dr. Ambedkar Stadium, New Delhi, today. 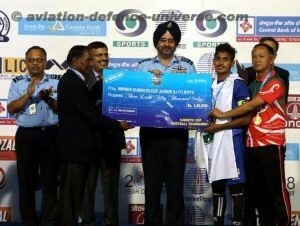 Air Chief Marshal BS Dhanoa PVSM AVSM YSM VM ADC, Chief of the Air Staff presenting the prize money to the Captain of Bangladesh Krida Shiksha Prothishtan (BKSP), Bangladesh Team after final match of Junior Boys (U-17) of Subroto Cup International Football Tournament-2018 held at Dr. Ambedkar Stadium, New Delhi, today. 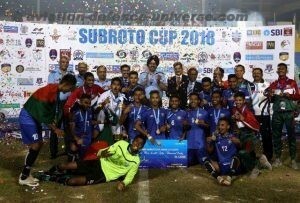 Air Chief Marshal BS Dhanoa PVSM AVSM YSM VM ADC, Chief of the Air Staff with the winning team Bangladesh Krida Shiksha Prothishtan (BKSP) after final match of Junior Boys (U-17) of Subroto Cup International Football Tournament-2018 at held at Dr. Ambedkar Stadium, New Delhi, today.